A motherland of country music (and each of its offspring), Tennessee’s capital city is bursting with sound. 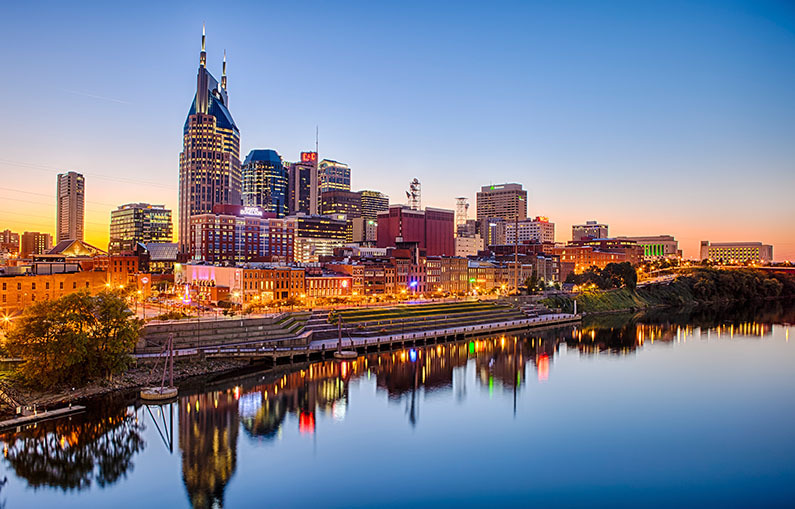 A classic Southern city at its core, Nashville thrives in its musical lineage, with a family tree boasting the likes of Willie Nelson, Patsy Cline, and Johnny Cash. Located in the heart of downtown Nashville, the Country Music Hall of Fame and Museum is the storied darling of “Music City.” With both modern and ancestral inductees, the Hall of Fame pays tribute to Nashville’s greats. Wander through and experience the evolution of country music, from its humble beginnings to its speedy foray into pop culture. On Saturdays, local songwriters perform and answer audience questions in the building’s Ford Theater. Who knows—you might just be listening to a future inductee. Once owned by Andrew Jackson, the Hermitage is a storied tribute to our nation’s seventh president. The plantation’s tour guides—in period-accurate dress—take visitors on a journey through Jackson’s life, traversing the grounds, mansion, and museum. Jackson, his wife, and other family members are buried on the property, which has been immaculately preserved since the late 1800s. Stroll over a stretch of Tennessean history and let your seventh-grade social studies lessons come to life. A beautiful tribute to the Man in Black, The Johnny Cash Museum is a worthwhile destination for music lovers and history buffs alike. With archives of Johnny’s personal history housed within, the museum provides a fantastic insight into the life of a talented—and troubled—musical mastermind. His captivating biography provides a stunning backdrop to the expertly crafted exhibits of Cash’s guitars, childhood relics, and other career memorabilia. As a crooner once exhilarated by the electricity of Nashville, Cash’s legacy in the Music City is everlasting. To plan your trip to Nashville or for an extended guide of things to do, visit the official Nashville city guide at http://www.visitmusiccity.com.